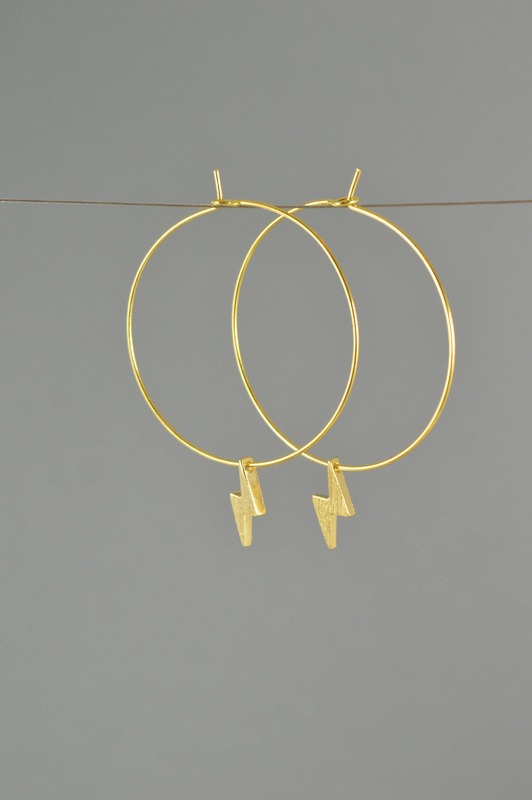 Hoop Size 1" 1.25" 1.5" 1.75" 2"
You'll love these cute little lightning bolt hoop earrings! 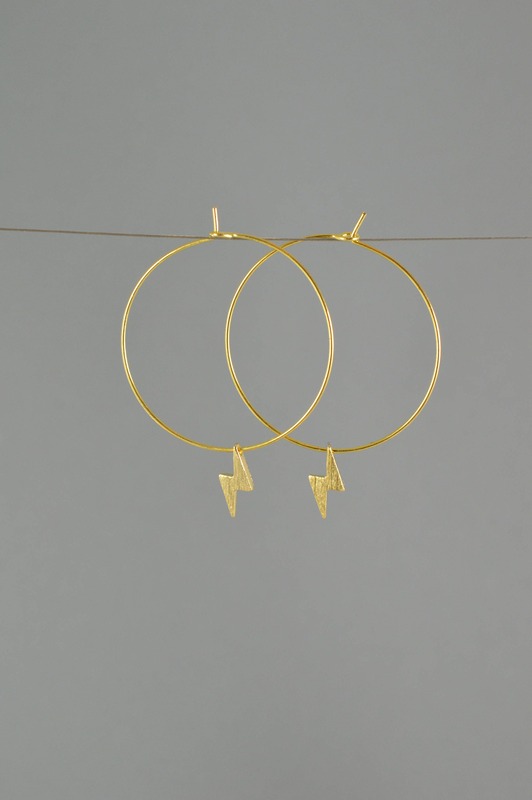 Tiny lightning bolt charms are suspended from handmade hoops. 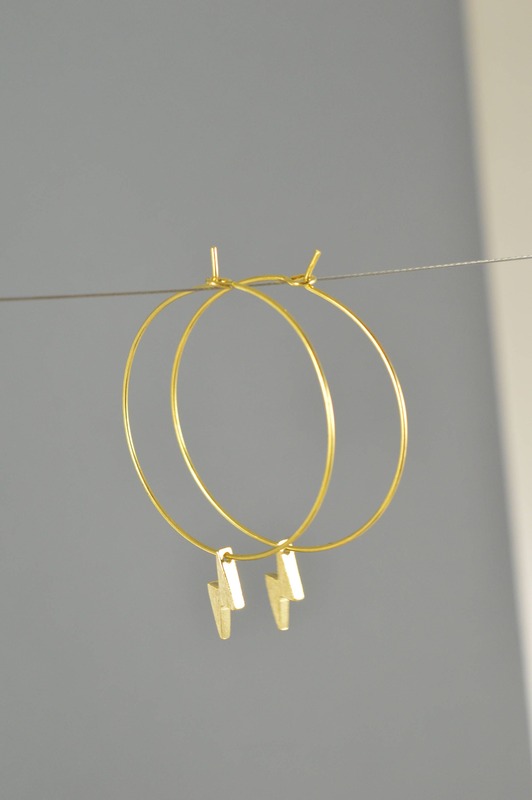 They come in your choice of 14k Gold Filled, Sterling Silver, or Rose Gold Filled finish. Treat yourself or give it as a gift! Customizable gift receipt/message options are available at checkout! All items in my shop are handmade. Please allow a 3-7 days for production. Free shipping includes USPS First Class Shipping only which takes an additional 3-5 business days. I offer shipping upgrades at checkout if you would like faster shipping. Shipping upgrades do not expedite production time, however I will be happy to accommodate you if you first contact me via etsy messenger and notify me of your deadlines, otherwise all orders will be processed in the order they are received. If you live outside of the US, please keep in mind International Shipping can take between 1-3 weeks and times will vary depending on your countries customs. I am the sole proprietor of my shop. If you have any issue or concern please contact me via etsy messenger and I will do everything I can to help find a solution. I will do my best to take care of you. I will respond to messages within 24 hours, but often within a few hours or minutes. Shopping is fun, and I want to help you keep it that way! Stay in the loop! Follow me on Pinterest & Instagram! Payment is due at time of order. Cancellations are accepted. Most items are usually shipped within 5-7 business days. Refer to specific item listings for processing time. All items are shipped via usps, shipped directly from the etsy website, and will include a tracking number. International shipping times and tracking availability may vary according to destination country customs. Each product is unique and handmade from natural stones. Slight imperfections of size and color are a part of the design. Expect some variations. With that in mind if you have a problem please feel free to contact me. Returns are accepted within 30 days. Lost packages are the fault of the postal service and will not be refunded but will be replaced. Wholesale and bulk pricing is available upon request. Send me a message if you would like to discuss wholesale pricing.